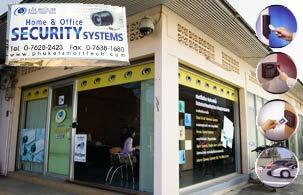 Phuket Smart Tech provides security products and services that make your life & job easier. We're more than just your supplier of integrated technologies: we're your partner in security solutions. We provide variety of security products and services: Access control system, CCTV system, Home audio etc. Phuket Smart Tech professionals have been applying a wide range of security solutions to a variety of specific problems. Whether your home, organization is big or small, our securities technologies are affordable, high quality solutions are provided to help protect assets and everyone.